German Pancakes go by many names...Dutch Baby, David Eyre Pancake, Really Thick Crepe. They are by far the easiest and most minimal breakfast you can make. 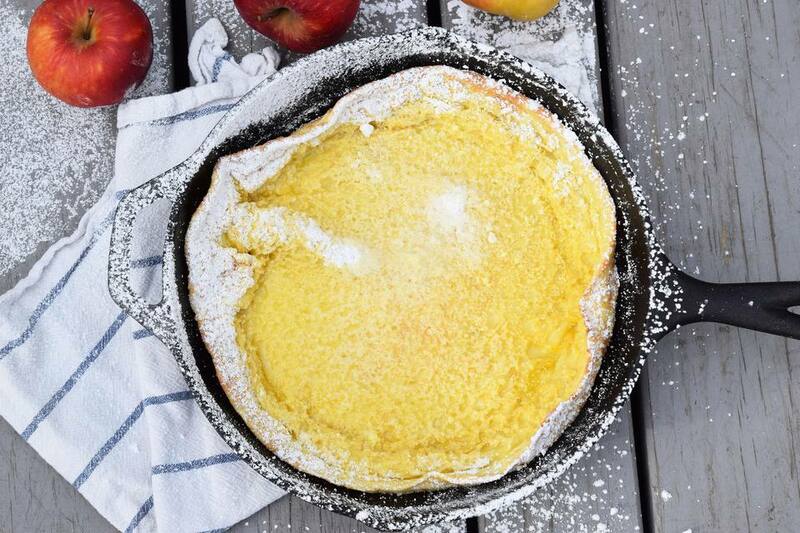 Only six ingredients, one bowl, and one cast iron skillet and you are in thick crepe heaven! Due to the eggs in this pancake, they puff up super high (like a souffle?) while cooking. Once you take them out of the oven they tend to deflate a bit, but the edges typically stay fluffy and slightly crispy on the outside. German pancakes are not only delicious, they are impressive! Their beautiful puffiness makes you look like a Top Chef when your friends, parents, or relatives come over to visit Our friends staying over is a common theme because we moved away from all of them :'( and we love it when they visit! We usually slice the pancake like a pie, but you could also double the batter and bake it in a casserole dish and cut it into squares! The best thing about these pancakes is that they are so versatile. You can add virtually any fruit or flavoring into the simple batter and you will have a totally new breakfast! I love making cinnamon apple ones by adding a teaspoon of cinnamon and chopped apples. Blueberry is also delicious too! They can also be made more savory. You can omit the sugar and add items like ham, bacon, and cheese! Make a fancy one with Gruyere and chives. OOOOO! The possibilities are endless! Beat the eggs and milk together with a whisk until smooth. Add the flour, salt sugar, and vanilla into the egg mixture and whisk until there aren't any lumps, but be careful no to over mix. Place 2 Tablespoons of butter in a cast-iron skillet. Place the skillet in the oven to melt the butter. When butter is melted, swirl it in the pan to evenly coat the surface. Make sure to use a pot holder!! Then pour the batter into the skillet. Bake on the middle rack for about 15 minutes until fluffy and not jiggly. Make sure to move the other oven racks out of the way of the pan. This pancake gets very puffy! Sprinkle with powdered sugar, cinnamon sugar, maple syrup or fresh fruit! Slice it like a pie and serve individual slices!